Eight years after a historic act of bipartisanship to address climate change, whirling wind turbines dot Minnesota's landscape, and solar panels glisten on urban rooftops. The state's utilities are ahead of schedule in meeting a mandate to provide 25 percent of electricity from renewable sources by 2025. The mandate was part of a 2007 energy initiative under former Republican Gov. Tim Pawlenty. But the state is falling short of the promise made in a second law the same year, the Next Generation Energy Act, which Pawlenty signed after nearly unanimous legislative approval. It created a goal to reduce Minnesota's share of the heat-trapping greenhouse gas emissions that scientists overwhelmingly agree are driving climate change. Although efforts to reduce greenhouse gas emissions are often the focus of international discussions, the state law in 2007 said by 2015 Minnesota should have reduced its carbon dioxide emissions by 15 percent from 2005. The most recent data, from 2012, indicate the state isn't even halfway there, and no one expects to hit the target. "We're not on track to meet the 2025 reduction goals, either," said David Thornton, assistant commissioner for the Minnesota Pollution Control Agency. "Given the kinds of things that are in place now, we only see a little bit more additional reduction occurring out to 2025 and 2030." The agency reported last month that carbon dioxide emissions in Minnesota dropped from 166 million tons in 2005 to 155 million tons in 2012. 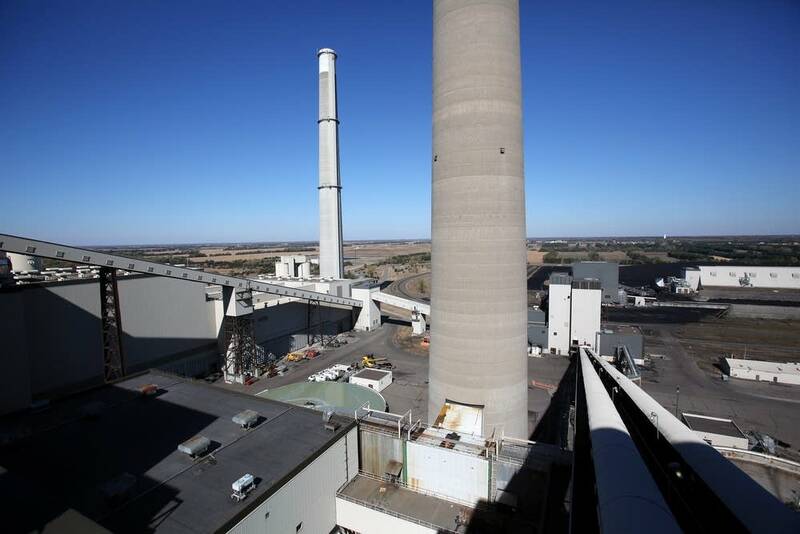 But a big factor was that part of Xcel Energy's coal-fired Sherco plant was temporarily out of use during 2012. Discussions among state agency leaders, business interests and others are under way now to determine how best to get the state back on track. "We've done a lot, we've accomplished a lot, moved the ball forward, but not enough," said Mike Harley, executive director of the Environmental Initiative, which is leading the discussions. Minnesota took action in 2007 when global warming was on everyone's radar. A year earlier, Al Gore appeared in the Oscar-winning documentary, " An Inconvenient Truth." Time Magazine published a cover story featuring a polar bear on melting ice. "Be Worried. Be Very Worried," the headline read. 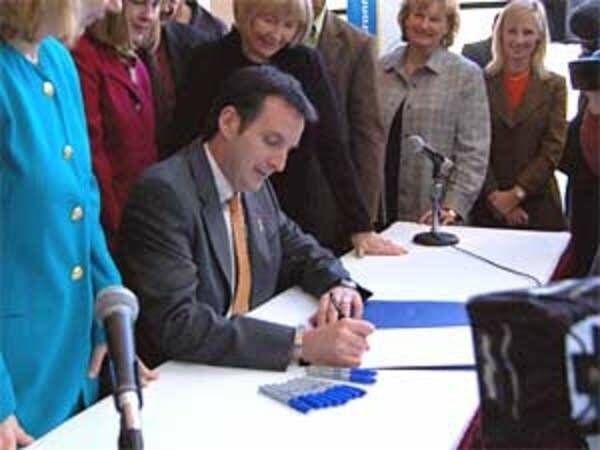 In Minnesota, Pawlenty made a proposal and urged lawmakers to add their own ideas and act on it. "Minnesota can't reverse global climate change by ourselves, but we can do our part and help lead the way. Our energy plan will significantly reduce the amount of carbon we put into the atmosphere," he said during his 2007 State of the State speech. First, Minnesota made national headlines by enacting one of the most aggressive renewable energy standards in the country. A few months later, the Next Generation Energy Act banned the construction of new coal-fired power plants, prohibited utilities from importing dirty power, required conservation measures and much more. A coal-dependent state in the Midwest was taking on climate change. Former state Sen. Ellen Anderson, a DFLer from St. Paul who now directs the new Energy Transition Lab at the University of Minnesota, remembers how Pawlenty handed her the pen after signing the first part of the legislation — the renewable energy mandate that Anderson helped write. "That was the highlight of my 18 years in the Senate," she said. "It felt like we were all together working jointly to do something that was going to transform our state's future, for years and years to come." There seemed to be political consensus nationally as well that something be done about climate change. During the 2008 presidential campaign, both Democrat Barack Obama and Republican John McCain advocated a market-based system to cap greenhouse gas emissions. Even McCain's running mate Sarah Palin, a tea party favorite, acknowledged during a TV appearance that climate change was at least partially caused by humans, although she and McCain endorsed the "Drill Baby Drill" slogan as gas prices peaked near $4 in the summer of 2008. Meanwhile, in Minnesota, a Pawlenty task force made 50 recommendations to help reach the greenhouse gas reduction goals, including stricter building codes, expanded use of biofuels and reduced speed limits. But most of the ideas went nowhere, and public opinion began to shift away from climate change as the Great Recession took hold. An effort in Congress to reduce emissions unraveled, and the tea party, a conservative arm of the Republican Party, became an important political force. Many tea party members denounced global warming and more than half of tea party supporters told pollsters global warming would have no serious effect at any time in the future. The movement made a lot of noise during the 2010 midterm elections, and by then Pawlenty and many other Republicans with presidential ambitions had abandoned their previous statements on climate change and cap-and-trade, saying they had been mistaken. During the 2012 presidential campaign, climate change was barely mentioned, and the same was true during Minnesota's 2014 gubernatorial campaign. Still, Minnesota has made progress. Reliance on coal has declined, and renewable energy projects continue to pop up around the state. For example, the Duluth-based utility Minnesota Power relied on coal for 95 percent of its electricity generation just 10 years ago. Today, coal accounts for 75 percent, and 20 percent comes from wind. 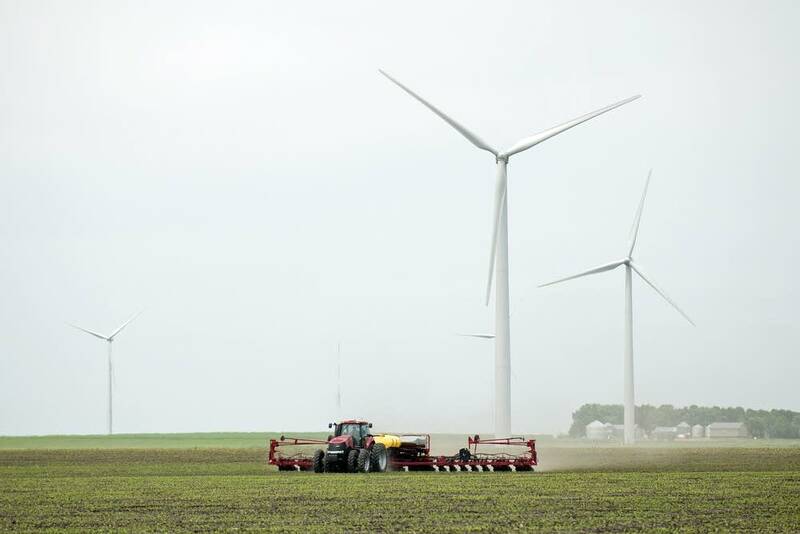 "It's a remarkable shift," Minnesota Power spokesman Pat Mullen said, adding that the utility ranks 8th in the nation for new wind development. Xcel Energy, the state's largest utility, is the No. 1 wind provider in the country and is beginning to make strides on solar generation, in part to satisfy a new state requirement that utilities generate 1.5 percent of electricity from solar by 2020. But when state lawmakers moved eight years ago to address emissions, they knew coal-fired power plants in the electric power sector weren't the only source of greenhouse gas emissions. "It is the largest source, but by no means the only source. That's the reason we're falling behind as much as we are," said Bill Grant, deputy commissioner for energy at the Minnesota Department of Commerce. Grant was one of the Next Generation Energy Act's architects in his previous role at the Izaak Walton League. 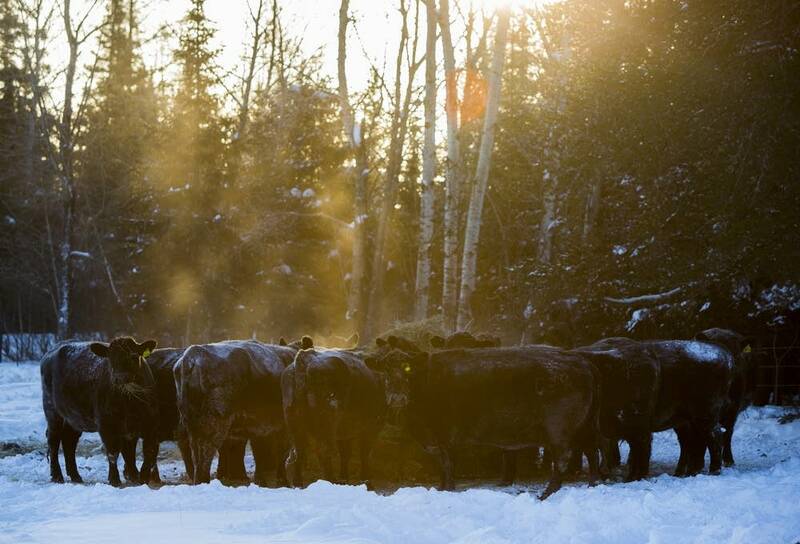 Greenhouse gas emissions include methane from landfills and burping cows, carbon dioxide from plowing corn fields and driving cars and even refrigerants used to maintain the ice at indoor hockey rinks. State leaders talk about Minnesota's emissions in four different areas. Think of them as four unequal legs of a stool. The power sector is the main one, making up 31 percent of Minnesota's emissions. Since 2005, Minnesota has reduced emissions in that sector by 17 percent. The next longest leg of that stool is transportation, accounting for a quarter of Minnesota's emissions. Emissions from cars and trucks are down, even though Minnesotans are driving the same number of miles, because vehicles get better gas mileage. But the state has made less progress on the last two legs of the stool: agriculture and buildings. Agriculture makes up 19 percent of emissions. It's the burping cows, but also fertilizing crops, which releases nitrous oxide, a greenhouse gas. And tilling soil releases carbon dioxide. The buildings category includes everything from heating homes to running factories. Thornton says those last two stool legs are going to be much more difficult to deal with. In the power sector, "there's only a handful of utility companies, and it's much easier to get your arms around that sector," he said. For transportation, there are millions of cars and trucks but only a handful of manufacturers, he said. But when it comes to getting individual farms, homes and buildings to change, he said, "you're dealing with just millions and millions of people and it's so much more difficult." 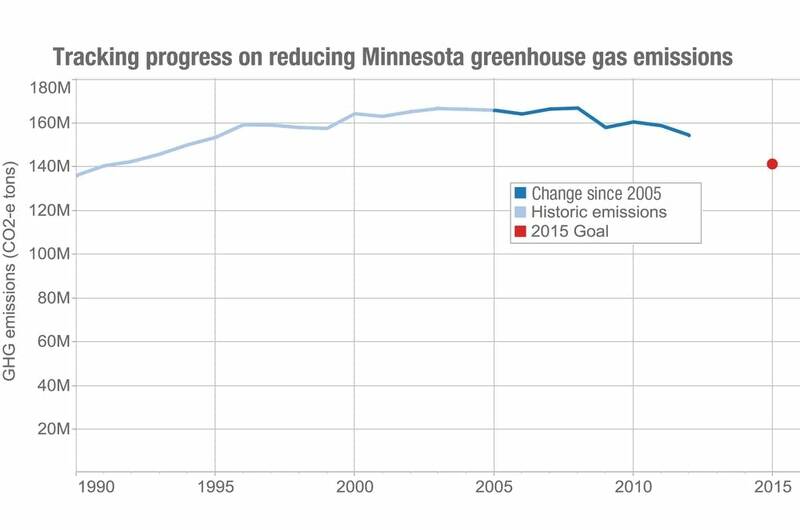 The fact that Minnesota is falling behind on its greenhouse gas reduction goals hasn't been lost on those who worked to enact them. A new group of leaders from business, environmental advocacy, state agencies and academia have launched an effort similar to what Pawlenty's climate change task force tried to do eight years ago. 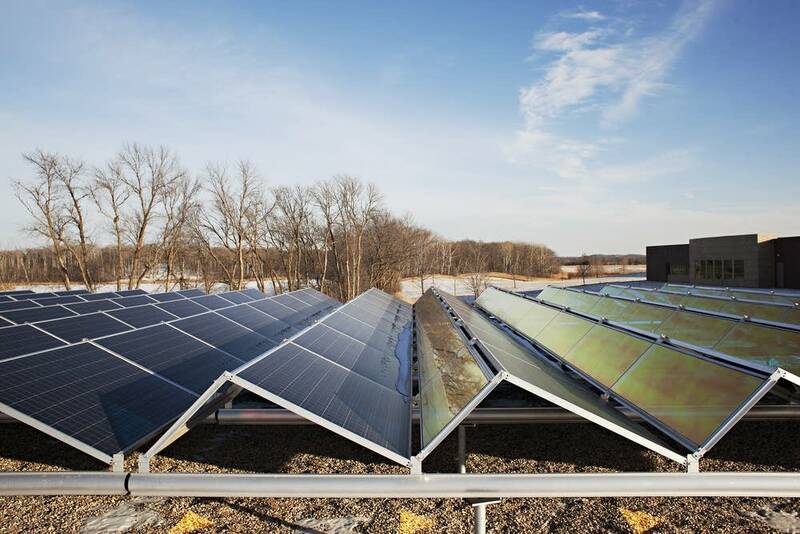 Climate Solutions and Economic Opportunities (CSEO) is looking for a path to reach Minnesota's climate change goals while encouraging economic growth. Instead of coming up with broad ideas, like many of the recommendations the first group presented, the new group hopes to recommend actions that could easily be implemented. Harley, of the Environmental Initiative, said it's been a challenge to get the conversation going again. "We haven't been able to have this conversation about climate change, in the way we're having it, for years," he said. "And then there's also the question of, is this the moment? And are we serious about it?" CSEO expects to come up with its recommendations in March. 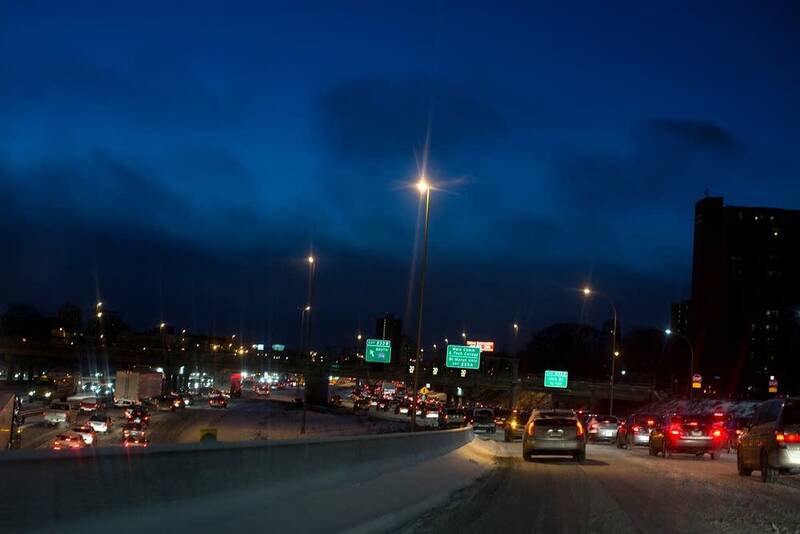 Whether they will go anywhere very quickly is uncertain, partly because lawmakers and the governor are focused on crafting a two-year budget and passing a massive transportation plan. Nationally, the U.S. Environmental Protection Agency is moving forward with carbon emissions regulations for power plants, but it appears unlikely President Obama and the Republican-controlled Congress will be able to agree on any significant climate change actions. Still, in Minnesota, several ideas are getting some buzz.They include boosting the renewable energy standard to 40 percent by 2030. The Minnesota Department of Commerce released a study in November 2014 showing that could be achieved without making electricity less reliable. Energy conservation and efficiency is also an area where leaders say there's room for more improvement. In some ways energy conservation is more difficult than it was in the early days of combating climate change. People have already changed most of their incandescent light bulbs, but they also have added all sorts of devices that require plugging into the wall. In offices, more desktops have dual computer monitors. At home, tablets, TVs and computers are running in multiple rooms. In the last three months of 2014, enough smartphones were sold for one out of every 20 people in the world to have one. But it's not just the devices. It's the data. "We think we use about half of our electricity in this room," said Rick Carter during a tour last month of the server room at LHB, a Minneapolis architectural and engineering firm that has one of the most efficient buildings in the state. Server hardware with flashing green lights was stacked from floor to ceiling, and all that hardware has its own air conditioning system to keep it from overheating. "We couldn't live without this," Carter said. "And that energy use intensity that we're trying to bring down — we're actually in some cases required by law to bring down — is being driven up by added density, added levels of equipment and added levels of data." Carter recently received a grant from the Commerce Department to work with the Center for Energy and the Environment and Energy Center of Wisconsin to study rising plugloads in buildings. "The real problem is we don't know how much energy things are using," he said. Minnesota has one of the fastest growing economies in the country, but the prosperity has a price in carbon emissions. The commerce department's Grant said the state needs urgently to find a way to preserve Minnesota for future generations. "The science just continues to reinforce the fact that we're reaching a tipping point, that life as we know it could be severely altered if we don't take very aggressive action," he said. "That message is just being reinforced all the time."